I am learning a lot at Vacation Church School. (VCS not VBS this year because we’re not actually studying passages from the Bible, but are studying Celtic saints.) Father Steven has been speaking to the children each morning briefly, and yesterday he showed the children all the vestments that Orthodox priests wear. The first thing a priest puts on over his black cassock (I think – may just be black shirt and pants) is a sticharion, a cassock-like loose-fitting garment. The garment is usually white, so it is similar to a baptismal gown, and as the priest puts it on, he prays to be reminded of his own baptism. The second thing a priest puts on is the stole (“epitrachelion”), which is that fancy long scarf-looking thing. This is a sign of an ordained priest and is also seen in icons of priests and bishops. The stole is worn around the neck to help the priest remember the story of the Good Shepherd who looked for that lost lamb and brought him back, carrying him on his neck. The priest, a saved sheep of the Good Shepherd, now ministers as a shepherd to his flock. The fourth thing is a diamond-shaped shield (“epigonation”) which to be honest I had never noticed a priest wearing before. 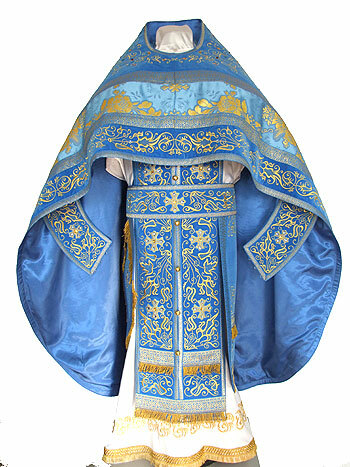 It is worn to the right side, and is a sign that the priest is able to hear confessions, and those confessions are shielded by God and by the priest. It is also a sign of God’s protection. Then the priest puts fabric cuffs on each hand. (At this point my memory is foggy – the cuffs might come before the shield.) As he puts on the right hand cuff, he prays that God might be his strength and his “right arm.” As he puts on the left hand cuff, he prays acknowledging God as Creator and Maker of himself the priest and of all the world. Next the priest puts on a shawl or poncho-looking thing called a phelonion. As he covers himself with this last piece, he prays for the righteousness of God to cover him. If the priest is an arch-priest, he wears a large gold cross with red jewels, which represent the people of his congregation, the treasures God has entrusted him with. Wow. Just wow. With every garment, the priest utters a prayer that humbly places him on his knees before God (spiritually if not literally) and that acknowledges his utter dependence on God. There is no opportunity for showiness or vanity: every moment for the priest celebrating a liturgy is a moment of humble prayer. It is VERY true that every little thing in an Orthodox Liturgy – every word, every note, every movement, every color, every cloth – MEANS something and teaches us something. I am so glad to be part of such a church. A church that does not need powerpoints and videos and live bands and big screens and amazing musical shows to teach us about our faith. There is no time for such things anyway. They would only divert our attention from the details that we need to see, hear, smell, notice – every minute aspect of the liturgy that reminds us of who we are, our history, our salvation, our God. Awesome!! Do you know why the priest waves the cloth over the chalice during the consecration? Now it’s to represent the Holy Spirit descending . . . when it started it was to keep the flies away. 😉 I love how many things we do have such practical beginnings!! Cassie – wow, how interesting! Make sense.